Another trip to Mustang Maniac at the weekend, I was loaded with tools, food and the enthusiasm to match. When I got there the sun was shining which just seemed to make everything much happier, if that makes sense. The task for the weekend was to finish the complete strip down of anything else left in or on the car. The last parts to come out were the brake pedal assembly, emergency brake and the glass from the doors. The emergency brake (hand brake) bolts to the firewall were held in place by a liquid metal that sets. I had a nightmare of a job to get to the bolt head having to chip it off. Eventually I got there and the bolts were removed and the handbrake cable itself. The brake pedal assembly is attached to the fire wall on the inside via four bolts from the back of the servo brackets and also to the back of the dashboard, this was easy enough to undo and remove, in fact much simpler than I expected it to be. The glass however I was little nervous about. They came out of the doors eventually after the guys told me the correct way of doing it, after I spent far too much time trying doing it myself. The bolts for the glass and the mechanisms were in all the wrong places and the fitted incorrectly previously, so it’s no wonder I had issues, well that’s my excuse anyway. My style of learning is not from a book, I can read the books, but it don’t go in. I can look at the pictures and it sort of goes in, but I need to compare it to the real thing. But, if I am shown how to do it, I remember it and it stays there, I’m a kinesthetic learner apparently so my wife informs me. I always assumed it was me being thick when it came to following instructions, apparently not, it just the way I process the information. Anyway I have added a link to the process of the window removal here or go to the quick link at the bottom. All that remains now is to remove the front and rear glass screens. Then she is a bare shell as she was the day she was made! Sunday was a day of cleaning and painting the parts from last week, the prop shaft was undercoated with a self-etching primer on top of the POR15 and sprayed white. Yes I did want it white which would match my shocks, and yes I do know I will be cleaning it. But it’s what I want and I am ready for the cleaning. The days I can’t take her out for a spin, I will be cleaning her. I took the brake pedal and the gas pedal assemblies apart and de-rusted them, then treated them to Under Hood satin black. They now look as good as new but took a little while. The Brake assembly was the worst on the inside of the bracket. I managed to get to the outside while I was doing under the dash. The clean-up of the rust parts was a bigger job and I needed to replace the inner bushes of the pivot pin. The process can be found here. The gas pedal was a very similar process and can be found here for the full process. 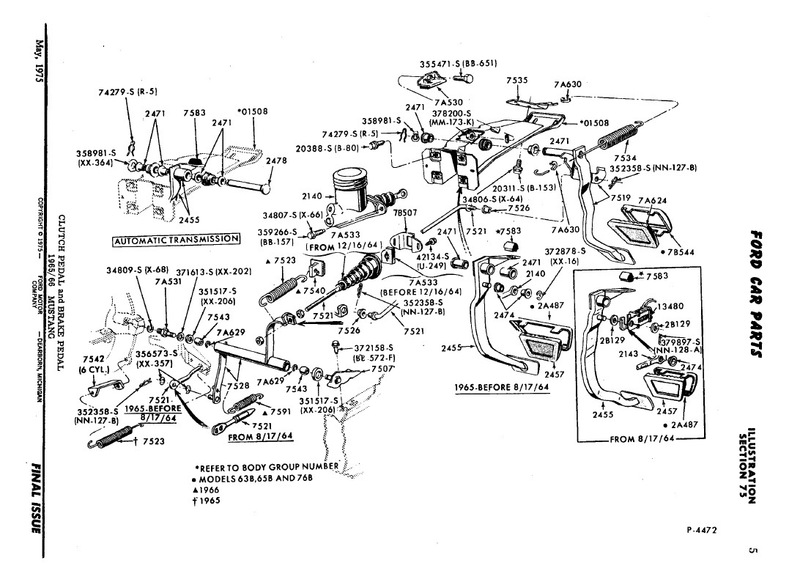 Gas & Brake exploded diagram can be found on the pages or click here to view it. This entry was posted in Car, Photo's and tagged brake & gas pedal diagrams, brake pedal assembly, Door glass, emergency brake, gas pedal refurbishment, Mustang, Mustang Maniac, por15, Prop shaft. Bookmark the permalink.